Theodore Amar Lyons (December 28, 1900 – July 25, 1986) was an American professional baseball starting pitcher, manager and coach in Major League Baseball (MLB). He played MLB seasons, all with the Chicago White Sox. He is the franchise leader in wins. Lyons won 20 or more games three times (in 1925, 1927, and 1930) and became a fan favorite in Chicago. He was inducted into the Baseball Hall of Fame in 1955. He has the second highest career ERA of any Hall of Fame pitcher. He is also the only Hall of Fame pitcher who gave up more walks than he had strikeouts. Lyons' 1933 Goudey baseball card. 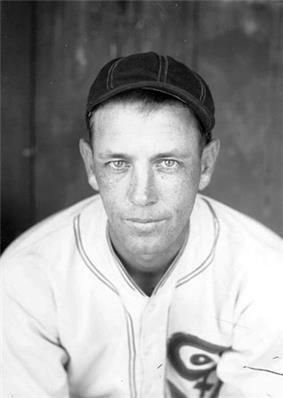 Lyons broke into the major leagues in 1923 after playing collegiate baseball at Baylor University. He joined the White Sox on a road trip and never pitched a day in the minors. He recorded his first 2 wins as a relief pitcher in a doubleheader on October 6, 1923, making him one of the first pitchers to perform the feat. He worked his way into the starting rotation the following year, when he posted a 12–11 record and 4.87 ERA. Lyons pitched a no-hitter on August 21, 1926, which took just 1 hour and 45 minutes to complete (Ted Lyons August 21, 1926 No-hitter Box Score). 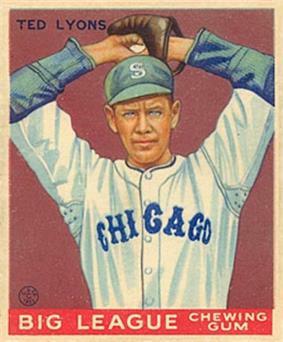 Lyons was at his crafty best in 1930, when he posted a 22–15 record and A.L.-leading totals of 29 complete games and 297⅔ innings for a team that finished 62–92. Prior to a 1931 arm injury, his pitches included a "sailer" (now known as a cut fastball), knuckleball, curveball, and changeup. After the 1931 injury, his pitches included a fastball, slow curve, knuckleball and an even slower curveball used as a changeup. As Lyons aged, his career benefited from the White Sox's decision to never let him pitch more than 30 games per season from 1934 on. He was such a draw among the fans that, as his career began to wind down in 1939, manager Jimmy Dykes began using him only in Sunday afternoon games, which earned him the nickname "Sunday Teddy". Lyons made the most of his unusual scheduling, winning 52 of 82 decisions from 1939 until 1942. During 1942, Lyons' 20th and last full season, he led the league with a 2.10 ERA and completed every one of his 20 starts. Although exempt from the military draft due to age, after the season he enlisted in the United States Marine Corps and fought in the Pacific War. In 1943, the White Sox announced that his jersey number would not be reissued. In May of that year, he was based in Chicago at the Navy Pier. He commented that he would not be able to return to pitching if the war lasted three or four more years. He made a brief return to the mound in 1946, with a 2.32 ERA in five games, all complete. He stopped pitching for good that season, having compiled a 260–230 record, 356 complete games, 1073 strikeouts and a 3.67 ERA. He never appeared in a postseason game, as the generally mediocre-to-poor White Sox were usually far behind the American League leaders during his career. In Lyons' 21 seasons with the Sox, they finished fifth or lower (in an eight-team league) 16 times, and never finished higher than third. New York Yankees manager Joe McCarthy said, "If he'd pitched for the Yankees, he would have won over 400 games." Lyons succeeded Dykes as the White Sox manager in May 1946 after an apparent contract dispute between Dykes and Grace Comiskey. He had less success as a manager than he had as a player, guiding them to a meager 185–245 record. Lyons resigned as manager in October 1948. Lyons coached the pitchers for the Detroit Tigers (1949–52) and Brooklyn Dodgers (1954). The Chicago White Sox retired Lyons' number 16. In 1955, he was inducted into the Baseball Hall of Fame. Lyons served as a scout with the White Sox until his retirement in 1967. Lawrence Ritter and Donald Honig included Lyons in their book The 100 Greatest Baseball Players of All Time (1981). On July 25, 1986, Lyons died in a nursing home in Sulphur, Louisiana. One year later, the Chicago White Sox retired his uniform number, #16. ^ "Chicago White Sox Top 10 Pitching Leaders". Baseball Reference. Retrieved 14 January 2011. ^ The Neyer/James Guide to Pitchers: An Historical Compendium of Pitching, Pitchers, and Pitches. Bill James and Rob Neyer. 2004. ^ a b Bullock, Steven R. (2004). Playing for Their Nation: Baseball and the American Military during World War II. University of Nebraska Press. pp. 110–111, 135–136. ^ Hoff, Dave (May 8, 1943). "Lyons plans return to mound after war". ^ "Pitcher Ted Lyons new Chicago skipper". ^ "O'Connor said to have left Chicago Sox". ^ "Chicago writers to honor Ted Lyons". ^ "Hall of Famer, Ted Lyons".